Step 2. Go to the "Ski Village." Step 3. 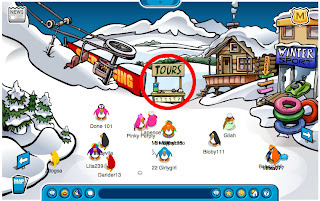 Click on the "Tours" stand. Step 4. 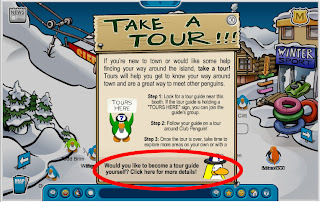 Now click, "Would you like to become a tour guide yourself? Click here for details." at the bottom of the "Take a Tour" sign. Step 5. Click on "Take the Quiz. Step 6. You must get at least 7 of the 8 questions correct. Here is a list of all the possible Quiz questions with the correct answers. Q. Which of the rooms does NOT have a game in it? Q. What item is thrown out of the truck in level 4 of Bean Counters? Q. Which of these games has a shark in it? Q. What item is always hidden in a different place in the Clothing Catalog every month? Q. What is the name of the big fish in Ice Fishing? Q. How many coins does it cost to buy a player card background? Q. What day does the news paper come out? Q. Which color of Puffle can catch on fire? Q. How do you get a Pin? Q. Which room has a Cuckoo clock? Q. How many Sled Racing tracks are there? Q. What is the name of Captain Rockhopper's ship? Q. Which of these rooms doesn't have music playing in the background? Q. In what room can you find old copies of the Penguin Times? Q. How does the pink Puffle play? A. Skips with a skipping rope. Step 7. After you have completed the Quiz. 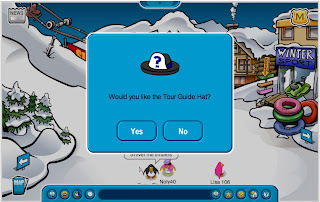 You will receive a Tour Guide Hat. Step 8. Then will be given the Tour Guide Manual. Step 9. After you read the Tour Guide Manual, you will be ready to give tours! Cheats are so cool. They make it so easy to learn how to do things, right? question, you don't click on it, you walk over it. It's true, I did the test. HOW DO YOU GET THE POLL??!?!! ?I WANT IT TOO!PLEASE TELL ME HOW! The Poll widget is available if you use Blogger.com blogging software. how do i hold up my tour sign? You have to be wearing your tour guide hat. Then wave. That's how you hold up the tour sign. hey, i just wanted to thank everyone who helps make this site......BECAUSE IT'S AWSOME! I hope you always keep this site! i know rock hoppers pass!!!!!!!!!!!!!!!!!!!!!!!!!!!!!!!!!!!!!!!!!!!!!!!!!!!! its the name but with no spaces in between the name or pass!!!!!! Ok "Rockhopper" what ever you say. I know how to hold up the tour gude sine u just press w on your key bored ! actually the answer to how do you get a pin is walk over it not click on it. i already knew most of that stuff but thanx for posting that y arent u a member?? when you want to hold up your sign make sure you are wearing ONLY the tour guide hat. it took me like an hour to figure this out. Thanks! i probabaly wouldnt have gotten it if you hadnt told me that! club penguin are breaking there own rules cause u can do a tour for agent hq and people are not allowed to tell each other if they are secret agents. hello, i am pillulete in club pinguin!!! How old do you have to be to be a tour guide? And what server do YOU go on Club Penguin in??? Thanks alot that helped me so much! You have to walk on pins to gt them. plzzz tell how to wave while holding the TOUR HERE sign?? heres a secret, how to do a backflip in cart surfer. hi i love club pinguin it is so grat that i play it evry day i love it. P.S iwill meet you today at 8:15pm i love club pinguin. 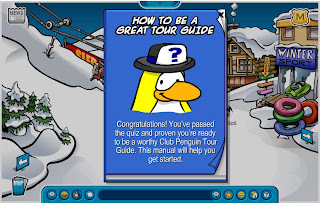 i did the tour guide test and passed and got the hat but the manuel didnt come up how do i get it? Now you get a postcard via penguinmail when you do the test. mimo, y u not a member? i need to know rockhoppers pass so you can catch me on cp sometime my penguin name is topsy so if you know please tell!!! thanks, mimo, this really helps when you need it! Hey mimo i posted your website on my blog so that if the poeple that r on my website cant find wat they need i told them to go to ur website Ok????????? This website is amazing, good work. THE HELPERS IN CLUB PENGUIN ARE JUST THE BEST!!! question, i passed the test and recieved a hat but no manual. what happened? um..... CPG, I HAD MY HAT ON AND WAVED BUT NOTHING HAPPENED. Thanks for leaving this cheat. I'm not quite old enough yet- just a couple more days. I'm very excited. Thank you to everyone who helps create this website; it's fantastic! And easy to use! how old do u have 2 be 2be a tour guide and mimo what site do u go on? 4. Click on your spy phone and do the field op. what if your not old enongh? how do you become a tour guide then huh!! I passed the test but i didn't recive the tour guide hat.plz help me out. I really want give a tour. I don't have my hat.I took the test but it only gave me the manual. It said i took the test but i'm only 40 days old. how do you get a tour? Just a question about becoming a tour guide- do you have to be a member? I'm just sort of worried because I will be able to be a tour guide this coming Tuesday (July 9th, 2013) And I'd like to know ahead of time. Thank you so much for being so considerate and kind and spending time on your blog to make Club Penguin players' experience better, easier, and more fun for everyone. P.S. Thank you for your wonderful and helpful blog. It has helped me so much as a Club Penguin player. Snow and Sports Catalog Cheat - Silver Surfboard! New Hidden Pin Cheat - Baseball! New Ballistic Biscuit game item - Wakeboards! Rockhopper's Cargo - Grand humdinger! New Free Item - Marshmallow on a Stick! Can you become a Ninja? PIN CHEAT: New Club Penguin Pin - Tent! Rockhopper's rockin' again - New free item! Want to join Club Penguin Gang? The new mission is out - Avalanche Rescue! Club Penguin Disney Channel Watch!